This year marks the 40th anniversary of China's reform and opening up. And Chinese President Xi Jinping declared at this year's Boao Forum for Asia 's annual conference 2018 that "China's door of opening up will not be closed, but will only open wider". Mr Xi also announced a series of important new measures to expand opening up, promising to ease market access, improve the investment environment, enhance intellectual property rights protection, and take the initiative to expand imports. China stands ready to work with other countries to promote trade and investment liberalization and facilitation, and to make economic globalization open, inclusive, balanced and beneficial to all. China is the biggest developing country in the world. Over the past half century, China's commitment to eradicating poverty has lifted 800 million people out of poverty. By the end of 2016, there were still 30.46 million rural people living below the poverty line in China, which is more than the total population of Australia. By 2020, China will achieve the goal of lifting all of its poor out of poverty and work with the whole country to become a moderately prosperous society in all respects. At present, the Chinese people are making greater efforts to achieve the "China dream" of the great rejuvenation of the Chinese nation. The China dream is interconnected with the dreams of people all over the world. The Chinese people and the people of all other countries should support and help each other to realize their respective dreams. China hopes to work with all the countries in the world to achieve common development and prosperity. China has unswervingly followed the path of peaceful development, adhered to the foreign policy of maintaining world peace and promoting common development in a bid to promote the building of a new type of international relations featuring mutual respect, equity and justice and win-win cooperation as well as the building of a community of common future for mankind. China adheres to the principle of non-interference in other countries' internal affairs and will not impose its will on others. And China has always honored its words with deeds. Since ancient times, the Chinese people have always been a peace-loving people, and the Chinese nation has always advocated the traditional culture of peace and a philosophy featured by "Harmony is the most precious", "harmony while different", "universal harmony" and "universal love, not offensive war ". China invented before Europe the compass, cast iron technology and gunpowder, but we have not abused the advantages of these technologies for invasion and expansion. Zheng He's voyages to the west were much bigger in scale than those of Columbus's to the American Continent. A country with the world's most powerful fleet at that time had not taken the path of hegemony. China has a clean history and has never invaded any country. On the contrary, China had been invaded and devastated by colonialism and imperialism for more than one hundred years. There is a famous saying by Confucius, the master of Chinese cultural thought, and a great ancient Chinese philosopher, that is, "do onto others what you want done onto you." China does not agree with the theory that a strong country is bound to be a hegemonic. There is no such a thing as hegemony and militarism in the Chinese bloodline. Since the establishment of diplomatic relations between China and Australia in 1972, bilateral relations have continuously transcended our differences in national conditions and social systems and achieved leapfrog development. From gradual enhancement of political mutual trust and increasing expansion of common interests, to the establishment of the China-Australia Comprehensive Strategic Partnership and the implementation of the Free Trade Agreement, the growth of our bilateral relations conforms to the mutual interests of our two sides and has brought tangible benefits to the two peoples. China is not only Australia's biggest trading partner, but also the latter's "first partner" in the overseas tourist market and for international students. Both the "mining boom" which helped Australian economy survive the global financial crisis, as well as the international education and tourism which drove the current economic transformation of Australia have all benefited from China's continuous strong economic growth and huge market. No wonder many analysts believe that the strong Chinese demand is one of the key factors in Australia's 26 year of consecutive growth. However, since the second half of last year, some Australian media have repeatedly fabricated news stories about the so-called "Chinese influence and infiltration"in Australia, and some Australian politicians also made irresponsible remarks which are not conducive to the mutual political trust between the two countries, putting our bilateral relations in jeopardy. I have also noticed that quite a lot of people from the Australian side have also expressed their different opinions on these matters. It is my view that China and Australia, both located in the Asia-Pacific region , are highly complementary in economic advantages and deeply intertwined common interests. Although the two countries differ in history, culture and social systems, there is no fundamental conflict of interest between our two countries. A healthy and stable China-Australia relationship will better serve the fundamental interests of the two countries and two peoples. I hope that the Australian media and people from all walks of life here can correctly understand China and China's development and view China-Australia relations in an objective and positive way. China values its relations with Australia. However, there is a saying in China, "one slap won't make a sound", or "it takes two to tango". It is our hope that Australia and China will meet each other halfway and do more to enhance mutual trust and cooperation on the basis of mutual respect and treat each other as equals, so as to ensure that China-Australia relations will move forward on the right track. 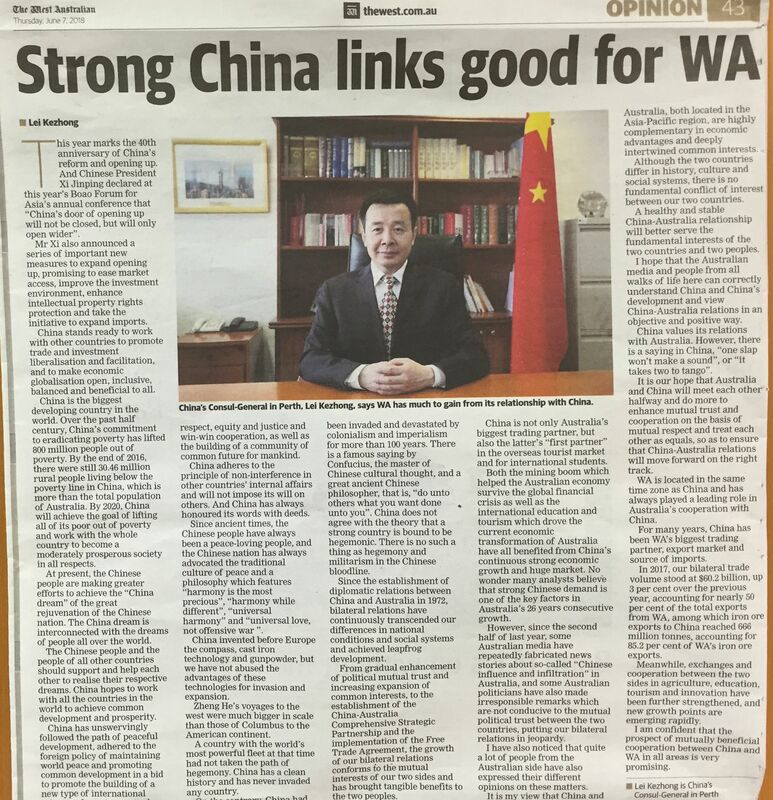 WA is located in the same time zone with China and has always played a leading role in Australia's cooperation with China. For many years, China has been Western Australia's biggest trading partner, export market and source of import. In 2017, our bilateral trade volume stood at AUD 60.2 billion, up 3 per cent over the previous year, accounting for nearly 50 per cent of the total exports from WA, among which iron ore exports to China reached 666 million tons, accounting for 85.2 per cent of WA's iron ore exports. Meanwhile, exchanges and cooperation between the two sides in agriculture, education, tourism and innovation have been further strengthened, and new growth points are emerging rapidly. I am confident that the prospect of our mutually beneficial cooperation between China and Western Australia in all areas is very promising.